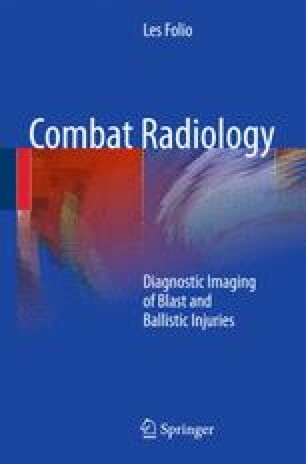 There are unique challenges to imaging extremities in a combat hospital environment and providing the information necessary to the orthopedic surgeons for surgical planning. Tremendous results have been witnessed in recent years with the judicious use of external fixators in the field . In addition, wound vacuum-assisted closure along with aggressive forward field surgical approach, premier air-evacuation, and appropriate antibiotic therapy have helped limb salvage on the battlefield and in the higher echelons . These temporizing stabilization and treatment modalities have saved the limbs of countless wounded warriors who would have otherwise lost their extremities or ended up with more severe disabilities such as those from prior conflicts. Example cases will be shown that have not been demonstrated in previous chapters, and only those unique to military combat setting. Again, even though military-specific from one perspective, any civilian setting can have combat-like conditions in a mass casualty disaster. Penska K, Folio L, Bunger R. Medical applications of digital image morphing. J Digit Imaging. 2007 Feb 2. http://www.springerlink.com/content/0574n3u78tt84vku/fulltext.pdf or http://dx.doi.org/10.1007/s10278-006-1050-5 (both accessed Dec 09).